Subject: . .YOUR PAYMENT READY FROM THE DESK OF THE EXECUTIVE VICE PRESIDENT. Office Of The Vice President. His Excellency, Prof Yemi Osinbajo,SAN. GCON.
. .YOUR PAYMENT READY FROM THE DESK OF THE EXECUTIVE VICE PRESIDENT. You are hereby requested to urgently revert back my office in the next 48hours and claim your over due funds directly under my office and desk as the Vice President of Federal Republic of Nigeria,i just stumbled on your payment file as an unpaid Inheritance/Lottery NNPC Contract Beneficiary of the approved sum of USD5.5Million . .Five Million Five Hundred Thousand Dollars- for this last quarter of the year 2018-which i have previously approved to be released to you by the Finance Minister and to my surprise she failed to carry out my instructions before she resigned from office last week,so in view of that i have taken over your payment file as the paying Authority in my capacity as the Executive Vice President of Federal Republic of Nigeria. call me on my direct private number so that we will discuss of about your payment and then transfer as your Payment File is on my desk now;. 234-7033206328. .don' t disclose this number to anybody else. and forward your details for your payment on this secured email id as thus. .yemiosibanjovpnigeria@gmail.com. . Furthermore get back to my desk with all your relevant details for your Swift Electronics Wire Transfer KTT after due Verification and Endorsement by my office for your immediate payment through a payment Instrument of Irrevocable Standing Payment Order. .ISPO. which is in tandem with my Executive Powers as the Executive Vice President of Nigeria and Chairman of the National Economic Council. NEC. ,i will revoke and dump your payment file if i don' t hear from you within the next 72hours from the date of this circular,you are supposed to be paid before now but i don' t know the reasons for the delay and you should count yourself lucky that i have personally intervened on your behalf as i will directly supervise and administer your payment directly without third party interference so long as you complied with my instructions on this transactions. .email me on this. yemiosibanjovpnigeria@gmail.com . His Excellency Prof Yemi Osinbajo,SAN,GCON. 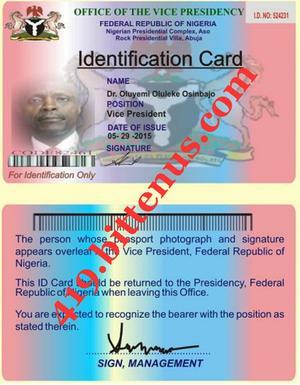 Executive Vice President Federal Republic of Nigeria. Sorry for the delay. I am delighted to contact you on a private note based on your claims to your funds which has been programmed for transfer into your designated bank account through my department. I hereby apologised to you for the delay in releasing this fund into your account, which was caused by me because of breach of agreement between The Central Bank of Nigeria Foreign operation payment director and your so-called partners in Nigeria who introduced you into the business. Your Nigerian partners approached him that they want to present you as a beneficiary of this fund as it was an OVER-INVOICING made when they are awarding contract to foreign firms. So after the negotiation, they unanimously agreed that (your partners) would give the Foreign operation payment director US$300,000.00 (CASH) on his acceptance to assist them to transfer the fund into your account. When he accepted the offer, your partners forwarded all your details including your banking particulars to his office then for onward transfer. As soon as he made some fruitful effort on the transaction and demanded his US$300,000.00 as agreed. Your partners deviated from the agreement and decided to go through the International Remittance Department at his back and make a change of your bank account details in other to disappoint him and you also not knowing that the International remittance Department is also under his control. In 2015 when i was elected as the Vice president of the Federal Republic of Nigeria under his Excellency President Mohammadu Buhari's administration i got the knowledge of their evil plans and selfishness i proved their illicit efforts abortive. That is why for some years now you have been pursing this payment, sending unnecessary money to some fraudulent individuals in Nigeria and abroad who claimed to be in charged to release your payment yet you didn't even received a cent till today. On Friday 26th, of January 2018 an approval was given by the Federal Government of Nigeria to commence a quarter payment Exercise and has Shortlisted your name among the 22 Foreign Beneficiaries for payment that will receive $2,000,000.00 (Two Million Dollars only) each. I want to re-emphasis to you that your fund is still with me and under my control. Now with my whole heart I want to enter into real business with you on a sincere agreement since your partners have disappointed me and the fund is still floating in your name and favour waiting for a proper documentation before the claim. All the necessary payments has been fully paid and settled by the Federal government of Nigeria reserve account for the procurement of all legal back up documents in your name and favour. Recalled that the United States Consulate in Nigeria Ambassador W. Stuart Symington had earlier admonished the Nigeria Government to pay all outstanding funds owed to Foreign Beneficiaries and Contractors. 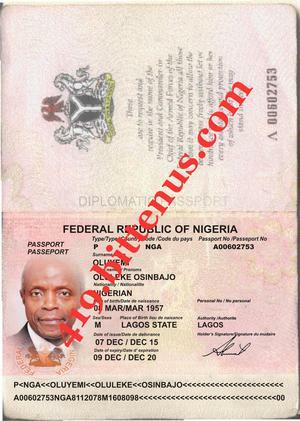 I the Vice President of Nigeria said it was an agreement by the United States/United Nations/Nigeria Joint Committee that to avoid impersonation, and wrong payment all shortlisted Beneficiaries must pay for their payment Authentication Accreditation and other Fund Release Logistics of flat fees of $250 each as mandated on the news paper articles and all payments must go to USA for confirmation and clearance. Here is the fiduciary receiving agent for you to make your immediate payment of $250 through Western Union or Moneygram. Awaiting for your rapid response.